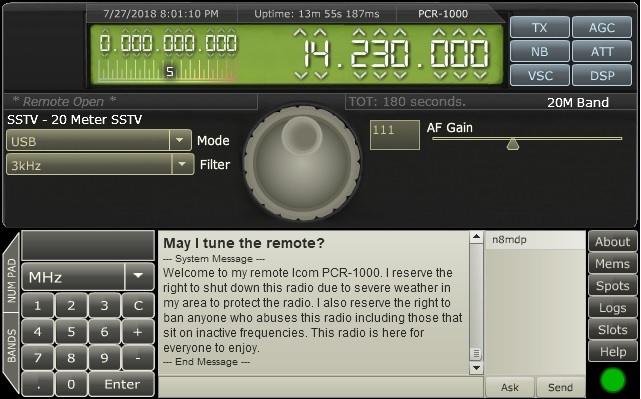 RemoteHams is a community of on-line radios throughout the world. Operating Guidelines. Please Follow the Rules; or the radio owner will ban you! * DO NOT tune an ORB without asking first. * DO NOT 'take-over' an ORB as if it is your own. * DO NOT relay any transmission heard to a 3rd party. * DO NOT use any ORB for commercial purposes. * DO NOT share your account information with others. Respect Admins and TX Users. Users with an (A) or (X) on a remote have special access and control over regular users. Please ask to tune the remote if someone else is present. If they do not respond within 2 minutes, feel free to tune. If they respond requesting you do not tune, please allow a maximum of 10 minutes for them to finish. Ignoring requests to tune from other users may result in you losing your tuning session. If you attempt to re-tune without allowing the new user 10 minutes to tune or do not ask to tune first, you may be "hi-jacking" the remote. For remotes that have the "Ask To Tune" system enabled, this policy is enforced (You have to ask to tune.). NOTE: If the radio sounds like it is not receiving anything, it is highly likely I turned the antenna off so I can use the antenna when I'm using my Kenwood TS-570D or Flex-3000 to work DX or for domestic QSO's. Check back at a later time to use the tuner. Click on the image below to start the tuner in a pop-up window.